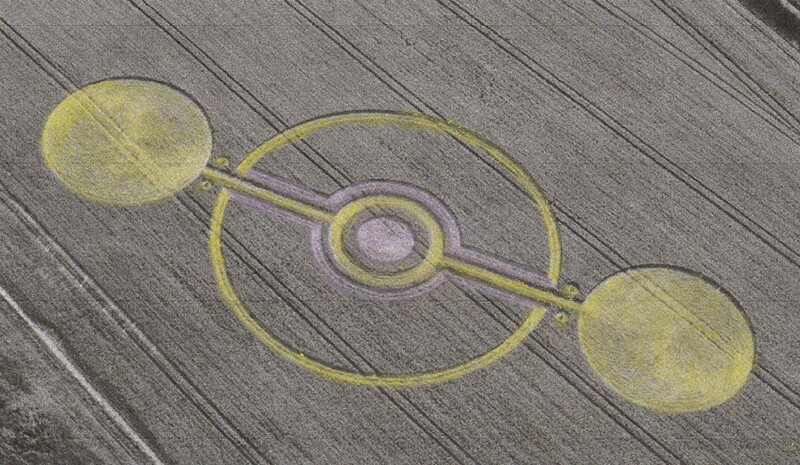 ‘Thought Expansion To Build Greater Consciousness’ Crop Circle. Translated by Suzanna Maria Emmanuel guided by CAEAYARON (KRYON) and the GALACTIC FEDERATION OF LIGHT SOCIETY. Namaste, I send you much love and light always. In the greater universe all is about finding the greater balance in order to expand love consciousness. Love is a prime power; a force of creation. The more love exists within the universe, the greater the power capacity is to expand the universe and to build greater creation. Creation within the universe is seen as the utmost importance. The greater the evolution is of life, the greater the energy becomes of strength, growing towards stronger creation, stronger evolution and stronger expansion. Since all things are thoughts, and in the higher sense all is an illusion, the balance goes towards the thought systems which are the strongest. The greater the thought system becomes collectively of love creation, the greater the power becomes of Divine, as Divine is pure love consciousness. Divine is a power field of love consciousness within itself, and the power is there to be given to all to expand into higher creation evolution, only if the stronger love thoughts come into existence. All through the ages it has been about looking within the thought system and seeing how all thought can move upwards. All through the ages the battle of the thoughts of the love versus the shadow thoughts have been playing, and so often the thoughts in the ‘darkness,’ those who have removed themselves from the love won the games and overtook so many beings of the love. It tainted the consciousness of love thoughts. Where ever the darkness was it infected the balance of the love. Once pure love was infected with darkness, it could no longer hold the great love. We are now living in a time to understand and awaken an incredible gift within us. We hold a key to bring our plane and mankind back to balance, for both link to all thought systems in the universe, thereby being able to bring the greater balance back in the universe to bring all into higher creation of love. To find this key the journey begins within as we are all part of collective consciousness. Together we can create more power within us, as true power is love consciousness, which allows greater power and greater privileges to be given to us by Divine to bring all into balance once we become of love. When people become aligned with love consciousness the balance will go towards the light. Once that has been completed, Divine will allow us to become more in line with Divine Will and the higher blessings will come because we have chosen to return to the great love. This is why our earth is here. Our universe was given the privilege to choose between what is love and what is not love. We are being watched by all star beings as they want to see the decisions we will make. We have the key within us to bring everything back to the balance, simply by choosing for the love or for the darkness. Our consciousness is far more powerful than we realize and when we begin to awaken to this, we can bring the stronger changes for ourselves and mankind towards the love consciousness. * Centre point is the earth, as an expression of human thought consciousness, and the violet colour is the healing flame of ascension. * The gold colour represents the light. * Around the earth you can see the darker and the light balance and the two gold keys are channelling more light into the system to expand the light, which the violet healing and forgiveness is converting the darker thoughts to higher vibration. * The outer light of the circle is the future area of expansion. * The two yellow circles represent pools of light which link into the earth light to expand it. It represents a balance in the greater light stability so that Divine can expand. The key to healing all the universe from all its darkness is us coming into the love and healing with the love, because our consciousness, our earth, is connected to all consciousness within the universe and our planet is connected to the darkest planet within the universe. Therefore, as Divine says, when our consciousness is healed and we come into the love, there will be no more darkness in any of existence, and we can begin to expand in greater love creation. There is much personal responsibility here, for to heal our world, we must heal ourselves; all things are a reflection of what is within us. The little circles on the side of the larger circles on the side generate the violet flame to bring into the system so that all flows are able to be healed.